I figured it was time to read the Eyrbyggja Saga again, and that was before I even knew I’d be speaking to the Icelanders in a week. I like Laxdaela Saga a little better, because it has stronger characters, but the two sagas are often paired, as they share a general locality and several major players. The big problem with reading any saga is keeping the actors straight. Every saga volume should include a detachable card with a list of characters on it (this is a particular problem with ebooks). And since about 2/3 of the characters have names that start with “Thor,” the struggle is real. I’ll confess that, supposed expert that I am, I lost track of who was who much of the time, and only guessed the teams by who they were fighting against. Eybyggja means “the Eyr builders,” or the people who settled at Eyr. Eyr is a locality in northwest Iceland, and I visited the area on my one Icelandic trip. The gist of the narrative is that proud men tend to step on each others’ toes, and in an honor culture that leads to bloodshed. Accident leads to insult, and insult leads to blows or seizure of property, and then honor is offended and the killing starts. This continues unabated until the death of the mighty chieftain Arnkel. With him out of the way, his rival Snorri the Chieftain (or Priest, a character who appears in my novel West Oversea) gains power. Snorri is clearly not regarded as highly as Arnkel by his neighbors (or by the saga writer), but it must admitted his sometimes devious schemes tended to promote peace, and the area finally gets some rest from killing under his influence. The really fascinating thing about Eyrbyggja Saga is its fantastic elements. There are a lot of ghosts in this story – the Norse kind of ghost, which is corporeal like a zombie (but does not, it should be noted, eat brains). Nevertheless these ghosts have a malign influence wherever they walk, and people tend to sicken and die – or even be assaulted – when they encounter them. There’s Thorolf Halt-foot, a malicious and greedy old man whose body must at last be burned to stop him walking. There’s Thorgunna the rich widow (who appears in West Oversea while still alive). There’s Thorir Wooden-Leg and his crew, who also appear in West Oversea. They provide the saga with a somber flavor that makes it unforgettable. Appended to this edition (William Morris’s translation) is also The Story of the Heath-Slayings, a fragmentary saga which features (again) some of the same characters, at least in bit parts. The section we have largely involves a raid by northern farmers against southern farmers (for revenge, of course). The story advances by choreographed stages (reminding me, for some reason, of The Magnificent Seven), and also leaves a strong impression on the reader (or at least on this reader). I’m not sure I recommend William Morris’s version. His intentions were good, if I understand them correctly – to use a lot of antique diction and obscure words to give an impression of the flavor of the Icelandic originals. But frankly, the sagas are hard enough to follow as they are, without all those obsolete words. 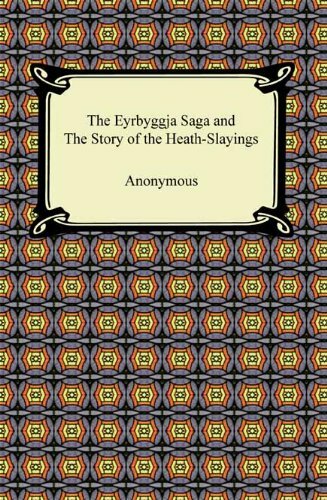 Eyrbyggja is not the greatest of the sagas, but it’s one the saga fan will not want to miss. Icelandic horses at the beginning of summer. Photo credit: Guillame Calas. Creative Commons license. Fair warning: There won’t be a post on Friday. I have faith in you; somehow you’ll endure. I’ll be playing Viking at an odd venue on Friday and through the weekend, the Minnesota Horse Expo at the state fairgrounds in St. Paul. The Viking Age Club & Society has been asked to provide context for the Icelandic horse exhibit this year. There will even be fight shows in the arena, though sadly the fighters will be old guys (not me; I’m still not up to that), as our young Vikings aren’t available. In real life, the Vikings would have probably had the stallions themselves fight, using goads on them. It was the Vikings’ favorite sport. •	It’s illegal to import any horse into Iceland, even an Icelandic horse. Once an Icelandic horse leaves the island, it must stay away forever. They’re afraid of bringing in exotic diseases or parasites. •	Breeders of Icelandic horses consider them the purest of the northern breeds. Author and artist William Morris (1834-1896) made a tour of Iceland with friends in 1871, producing a journal which I consulted (through a kind loan by Dale Nelson) in my research for West Oversea. He grew very fond of the horse he rode on that tour, and planned to bring it home with him. However it went lame before embarkation, so he took another horse instead. It lived to a good old age and grew very fat on his estate in England. I shall tell you more about Icelandic horses next week.